It’s the summer holidays and Rob is really struggling when his 13 year old granddaughter, Chloe, comes to stay. Her mum says she’s mixing with some bad friends and needs a break, but Rob soon realises that more serious things are going on. “Don’t you get it, granddad? It’s got nothing to do with my friends, it’s me! My mother sent me here cos she doesn’t want me! Cos I’m a bad girl! And I do bad things, alright?… Cos I’ve got a boyfriend who loves me, and she’s got my stepdad and a screaming baby! Can the audience help Rob to understand what’s happening and get through to Chloe before it’s too late? 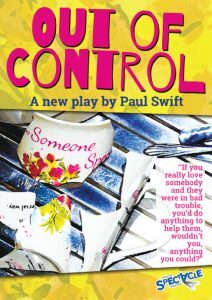 Out Of Control is a participatory play that examines the issues around grooming and Child Sexual Exploitation CSE. The play is part of an educational theatre programme that supports work on health & wellbeing, safe relationships and mental health. 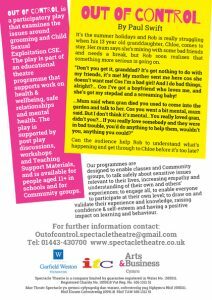 The play is supported by post play discussions, workshops and teaching support materials, and is available for people aged 11+ in schools and for community groups. Our programmes are designed to enable classes and community groups, to talk safely about sensitive issues relevant to their lives, increasing empathy and understanding of their own and others’ experiences; to engage all, to enable everyone to participate at their own level; to draw on and validate their experience and knowledge, raising confidence & self-esteem and having a positive impact on learning and behaviour.